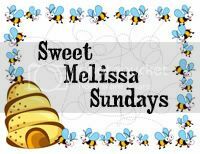 This week's Sweet Melissa Sundays (SMS) recipe was chosen by Karen of Karen's Cookies Cakes & More: Brown Sugar Vanilla Ice Cream with Hot Fudge Sauce or Butterscotch Sauce. I've always heard about how homemade vanilla ice cream is so much better than store-bought vanilla ice cream, so I was excited to try this recipe. Throw in the brown sugar component and it makes it sound all that more interesting. This recipe is actually a custard ice cream, with the addition of eggs that makes it richer and creamier than regular ice cream. This was probably about the easiest custard recipe I've made so far because it doesn't require tempering the eggs by adding a hot milk/cream mixture slowly to an egg/sugar mixture. All you do is mix all the ingredients together in a bowl, set it over a double boiler, and the stir until it reaches 180F. I actually had trouble getting my custard to reach 180F, and noticed that in Dorie's ice cream recipes (like the burnt sugar ice cream) she only recommends heating the mixture to 170-180F. So after I mine reached 170F, I went ahead and stopped cooking it and started chilling it. This didn't seem to affect the outcome at all. Although the recipe states that you need an ice cream maker, you actually don't - I made ice cream last year without an ice cream maker using this method. This is a rich and creamy vanilla ice cream. The brown sugar does lend some extra depth to the flavor but is not overly noticeable. I think most people wouldn't even notice the brown sugar in it. Instead of serving this with the hot fudge sauce or butterscotch sauce recipes in the book, I decided to make my favorite ice cream accompaniment - Bananas Foster! It was the perfect way to serve this brown sugar vanilla ice cream. Bananas Foster is so easy to make and so delicious (I've included the recipe below). Usually bananas foster is made by flambéeing bananas, but I usually skip the fire show and it seems to taste just as good. I also omit butter from the recipe to save a few calories (every bit counts right? ha!). Thanks Karen, for choosing this recipe - I loved it! If you would like the recipe, you can find it here. Make sure you visit the SMS Blogroll to see what everyone else thought about this creamy summertime treat. - Carnation makes a non-fat skim milk powder that you can usually find at your grocery store. If you can't find any skim milk powder, just omit it from the recipe. - Don't have a candy thermometer? I recommend this digital thermometer which is great because it works a low temperatures for checking meat, but also reads high enough to double as a candy thermometer. - Save those leftover egg whites for later so you can make something yummy like the Coconut-Roasted Pineapple Dacquoise! Freeze your egg whites, as discussed here. - As long as your mixture gets above 170F, it should be safe for consumption. Add the brown sugar and rum to a saute pan and cook over medium heat. Once the sugar starts to dissolve in the rum, add the banana slices. Continue cooking for about one minute, then flip the banana slices over and cook for another minute until bananas are cooked through. Let cool for a few minutes, then serve over your favorite vanilla ice cream. Oh my, that looks enticing - love that is has a rich, custard texture!! Perfect for these hot glorious summer days! This sounds (and looks) SO wonderful! This looks delicious!! The bananas foster is a perfect addition!! Bananas Foster and Ice Cream? You are my hero! Looks good! I love the gooey comment! LOVE it! Wow, this ice cream look so good. I love the caramelized look on your banana. Delicious! That looks so delicious! I love the bananas. I've never made my own vanilla ice cream, though I bet it is delicious, especially with the brown sugar. And the bananas look wonderful too! OH. MY. GOSH. This is like heaven in a bowl for me! I wish I had some right now! YUM! What a dreamy way to serve this! My ice cream maker broke and I'm hoping to replace it this week. I was so bummed when it broke because I desperately wanted to make this recipe. It looks just as incredible as I imagined it! Yum Im still drooling over here after looking at that tsty ice cream and the wonderful banana foster..what a great combo. I so want to try this recipe and try the bananas too. I have to buy another ice cream maker, cus mine died! Awesome tips (i couldnt find the Carnation powder, though -- so i bought the caseload)! Thanks for making the ice cream with me this week. This was a hit in my house. You had me at bananas! ;) Looks de-lish! I agree with you on the ice cream flavor - I didn't think the brown sugar was all that noticeable. Nevertheless, I thought the ice cream was awesome! Yours looks yummy - great pictures! I could use a bowl of that right now. Looks so good! Yum! Caramelized bananas. What a great idea. Wow! This ice cream looks so creamy and delish! I'm glad to found your blog, it's beautiful! I already add it on my favorite blogs list, I hope you don't mind! Caramelized bananas with rum sounds really good! Your ice cream looks perfect! I love the bananas. Your scoops look perfect! And that bananas foster version, oh my! This looks delicious! I love bananas foster but haven't had it in way too long! The bananas foster topping just took that already yummy ice cream to a whole new level of yumminess! Oh my~ This looks so delicious!! What a treat, banannas foster, yummy!!! Your ice cream looks amazing and I love the bananas. I made this ice cream a little late and absolutely loved it. You're right - the brown sugar does add a nice depth of flavor. And your bananas are a great substitution for the butterscotch or chocolate. Awesome job Jaime.